"These samples will give speaker cones a good flap! 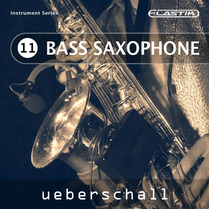 5/5 Stars"
Ueberschall's Elastik-based library series now runs to dozens of titles and Bass Saxophone is one of the latest additions. However, the company used to offer a different front end with libraries in the Liquid Instruments series. These tended to be melodic instrument samples because Liquid included pitch manipulation technology based upon Celemony's Melodyne. This meant that you could take a melodic line and re-pitch the sample within the plug-in, which was great for getting more mileage out of your samples and creating more natural variation within your sample-based performances. As most top-notch DAWs now include pitch correction/manipulation tools in the vein of Melodyne (if not always in the same class), it's easy to understand why Ueberschall have focussed on Elastik rather than Liquid, but if you have suitable pitch adjustment capabilities in your setup, then Bass Saxophone is an ideal candidate to use them with. The library includes about 450MB of sample data spread across 140 samples. All the performances have been recorded as sub-100bpm tempos and they are organised into nine tempo/key-based folders. And they sound gorgeous! Each sample contains a short melodic phrase and these have been beautifully played (by David Milzow) and beautifully recorded. All the samples are presented dry so you can add compression and reverb to suit your own needs but, even without any processing, they sound big and fat with the full bottom end of the sound being captured. These samples will give speaker cones a good flap! Style-wise, the mood is mainly soulful and melodic while the slow/mid-tempo range means they are just perfect for that sax solo in your latest soul-based love ballad. That said, apply a little tempo stretch and you could easily craft out some more Yello-style funky riffs (think 'The Race' only with more punch!) from amongst this lot. Usefully, the sound is fairly consistent across all the folders; finding a few phrases to link together for a solo instrumental section is, therefore, a breeze, but it is also possible to construct an extended solo if you are trying to create a full instrumental piece. And, if you render out the samples from Elastik to an audio track, tools such as Melodyne or Cubase's VariAudio can make short work of re-pitching the melody to suit your chord progression. The sax is a beautiful instrument but, in a solo context, it can be very difficult to achieve a believable performance from a virtual instrument without doing a lot of hard work to recreate the very expressive nature of the sound. In contrast, the sample phrases within Ueberschall's Bass Saxophone have all the expression you could hope for and, with judicious use of a suitable pitch manipulation tool, you could make these loops go a long way. At this price, Bass Saxophone comes highly recommended.